The Grand Tennis Club held the Shine in the Sun Tennis Tournament November 12th-16th in Sun City Grand. Two hundred players came from the Valley, the state, and the nation to participate in the event. 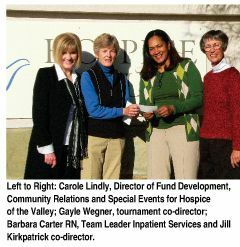 Hospice of the Valley was chosen to share in the profits of the tourney. Jill Kirkpatrick and Gayle Wegner presented Carole Lindly and Barbara Carter a check in the amount of $10,000 for use at its Surprise facility.